In 1943 the private Ranch School for “privileged boys” was forced to close and the government appropriated the property for the home of the Manhattan Project. Today, a story like that might raise some sort of investigation, but in the war-torn forties, everything stayed hush- hush. The isolated New Mexican plateau, Los Alamos, was chosen to become headquarters for research and development of the atomic bomb. Many of the world’s greatest scientific minds accepted the southwestern assignment and were led by J. Robert Oppenheimer, a theoretical physicist, from 1942-45. They understood the significance of the endeavor and believed the power of a nuclear bomb would end World War II. They also worried that the Germans were developing nuclear warfare and wanted to beat them. A hastily built “Secret City” sprung up with nameless streets. Drivers licenses, auto registrations, bank accounts, income tax returns were issued to numbers rather than names. Outgoing mail was censored, long distance calls monitored, all incoming mail was addressed simply to “PO Box 1663, Santa Fe, NM.” No one was permitted to mention titles or occupations of fellow residents, give names of nearby places or describe the view to prevent the location from becoming known. As work progressed, the intensity of the project continued to expand, as did the number of employees, many of whom labored twelve or more hours a days to reach the goal. They pushed forward and successfully assembled and tested the first atomic bomb, approximately 200 miles from Los Alamos, in Alamagordo on July 16, 1945. By early August, President Truman gave orders to drop the powerful new bombs on Japan and shortly thereafter, the Japanese surrendered on September 2, 1945. I recently visited the New Mexican region and learned the details and importance of this historic endeavor, something essentially unknown to today’s children. Fortunately two museums in Los Alamos keep the story alive. The Los Alamos Historical Museum, housed in one of the guest cottages from the old Ranch School, highlights the region’s lifestyle changes from ancient to modern. The collection includes personal artifacts and memorabilia such as native pueblo pottery, old driver’s licenses and envelopes addressed to the Santa Fe PO Box, post-war board games toying with nuclear destruction and 1970’s anti-war bumper stickers. 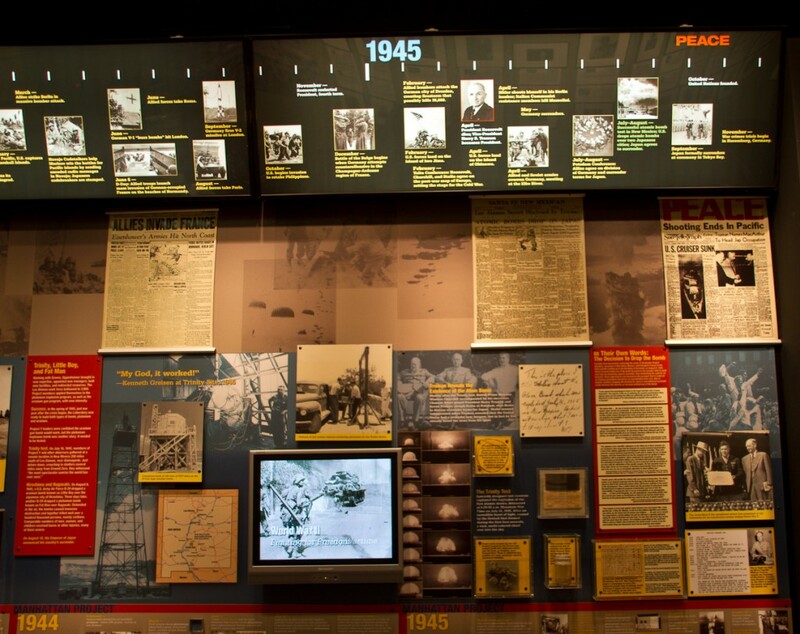 The free Bradbury Science Museum informs visitors about the war days, the Manhattan Project and its covert mission through a timeline using newspaper headlines, photos, news reel footage and documents. Their must-see movie portrays the obstacles faced by the U.S. team in trying to create the first atomic bomb. 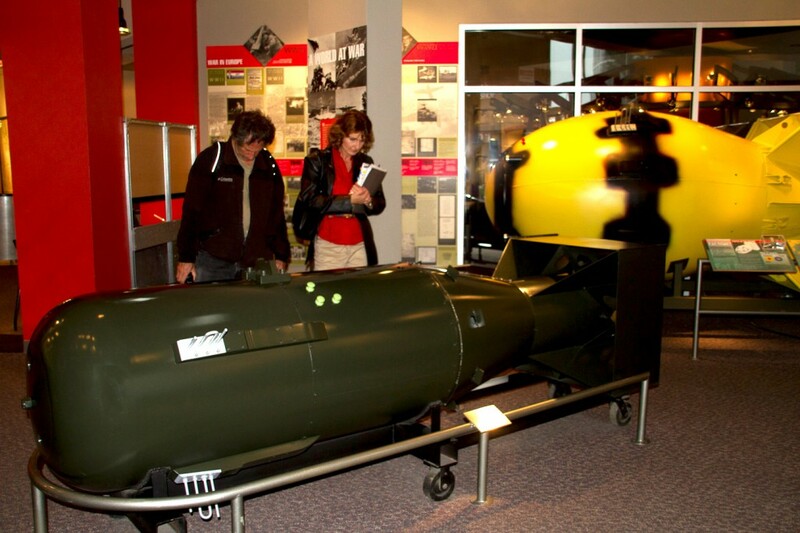 The exhibit area features replicas of Little Boy and Fat Man, the nicknamed bombs dropped on Hiroshima and Nagasaki, Japan. A second film in the Bradbury explains the on-going national security mission of the Los Alamos National Laboratory. Even though the lab also engages in genetic research, it remains a place of secrecy as the official “stockpile steward, ” ensuring the safety and reliability of US nuclear supplies. Since the lab is the area’s major employer it’s not surprising that a study conducted by American City Business Journals in 2004, reported that Los Alamos County has one of the highest number of PhDs per capita in the US. To me, the town exudes a mysterious aura, it feels tight. Roadblocks still exist, but are seldom used. A guide told me not to point my camera or photograph the exterior of official lab buildings, not even from across the street. 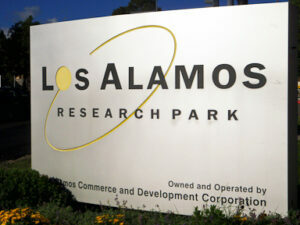 Los Alamos seems torn between touting its historical title, “The Atomic City” or presenting a more peaceful modern face. Who knows if the culture can or should be separated from science and technology? The bomb created on this New Mexican mesa might have ended a war, but it sparked a global obligation to respect its power. One we should not forget.